Some nice historic shots from Geoff Jones. 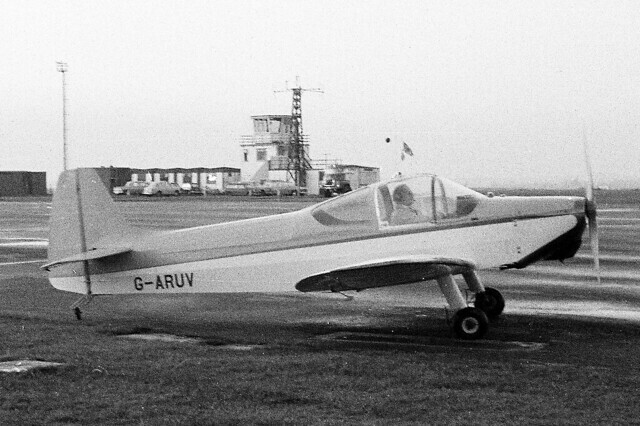 1964 - Piel CP.301 Emeraude G-ARUV pictured some time soon after its first flight in 1964 with the late Bill O'Niell in the cockpit. It was built at Cardiff, from plans, by the Cardiff Ultralight Aircraft Club in a former war-time Nissen hut next to the old fire station, which is about where the terminal is now. Registered to Peter Harrison it was finished in a yellow and white scheme. It is still current and believed to be Bodmin based, but with a lapsed permit to fly. 1965 - The UK's first two Victa Airtourers, G-ASYZ, the demonstrator, and G-ASZA, just delivered to Glamorgan Flying Club, at Rhoose in 1965. 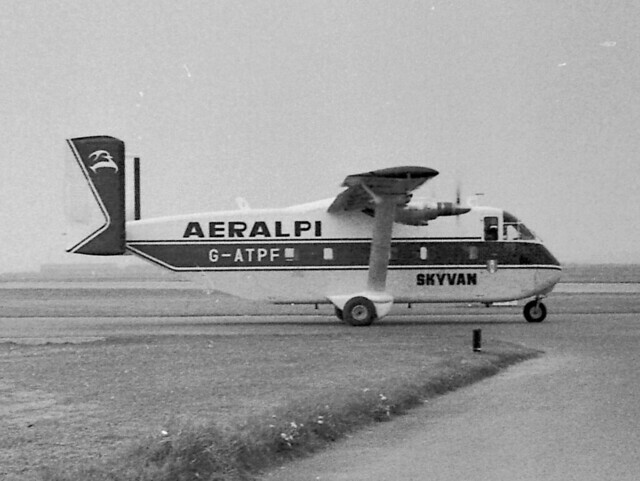 1967 - Short SC.7 Skyvan 2-100-2 (SH1833) G-ATPF in Aeralpi scheme at Rhoose on 29/04/67. Withdrawn fom use on 27/01/69 and broken up at Sydenham in 11/76. 1966 - From the French rugby airlift of 26th March 1966, Beech D50 Twin Bonanza F-BIAL. 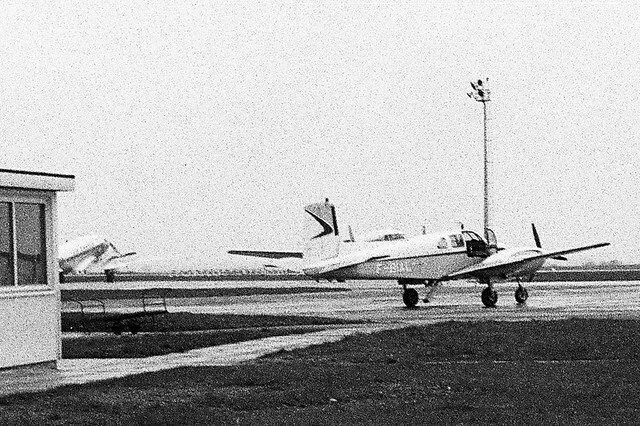 In the background, on what is now the Cambrian apron, are Dakotas F-BBBE of Air France and F-BAXR of Rousseau Aviation. 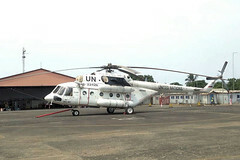 F-BIAL is still current, based at Villeneuve-sur-Lot in US Army colours as O-76061. F-BBBE became TL-AAD in October 1966 and was withdrawn from use in 1984. F-BAXR was withdrawn at Toulouse in May 1976 and scrapped in 1978. 1962 - This photo must have been taken in the early 1960s and courtesy of Peter Phillips we now believe it to be 1962. The reason being is that a Paris was logged by Peter during school term time and he logged it as No.112. 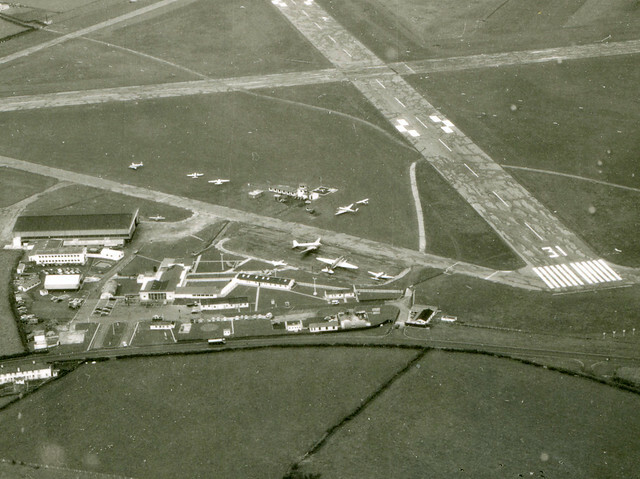 It can be seen in the photo before the Cambrian apron was built and whilst Aer Lingus were still flying Dakotas and is tucked in close to the old terminal. A Piaggio P166 and a Queen Air are parked on the grass to the west of the watch tower and a Heron is on the grass to the east of the tower. 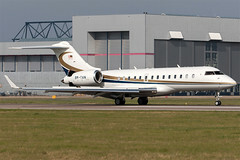 Prior to this date there were limited numbers of jets to have visited Rhoose and it is considered by Mike F that this was the first business Jet to call into the airport.